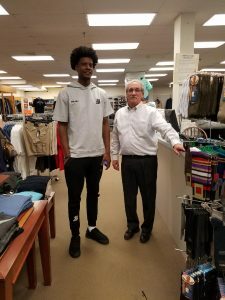 Some of the areas famous Big & Tall athletes and other celebrities have been customers and become friends of ours over the years: Some of them include Lawrence Taylor (N.Y. Giants), Harry Carson (N.Y. Giants), Darryl Dawkins (Philadelphia 76ers & N.Y. Nets, a/k/a Chocolate Thunder), Johnny Cash (yes, THAT Johnny Cash- he was a pretty big dude and had ties to Asbury Park), Clarence Clemmons (of Bruce Springsteen’s E Street Band), Gorilla Monsoon (Pro Wrestler), D’Brickashaw Ferguson (N.Y. Jets All-Pro Lineman), Kelly Tripucka (Notre Dame, Denver Nuggets), Josh Jackson (4th Pick of the 2017 NBA draft – from Kansas Jayhawks, photo below), Bam Adebayo (14th Pick of the 2017 NBA draft – from Kentucky). That’s right, if you email us or call us ahead of your visit, we can arrange to have a selection of items for you to look at. Just give us an idea of what you’re looking for, your size, preferred colors, style, brand, etc. and when you arrive at the store, we’ll be able to get right to working with you. If not, just come in and we’ll find what you’re looking for. Call us: 732-922-1525 or email us: info@franksbigandtall.com.